Where ALL the GOOD SONGS Have Gone! The BEST of the 50's and 60's - When the BEST MUSIC was made! Girl Groups, Teen Hearthrobs, British Invasion, BEATLES!, Psychedelic, and even Bubblegum! In the nighttime hours, feast your ears on our collection of Rock, Modern Rock and Funk tunes. On Sunday mornings, tune into American Popular Standards. and all the tunes from the Great American Songbook. All music is selected and programmed locally... and we're totally commercial free! So tune to 98.1 in central Franklin County, or listen to the streams below. Pick the first stream below. If it is off, try the second stream. 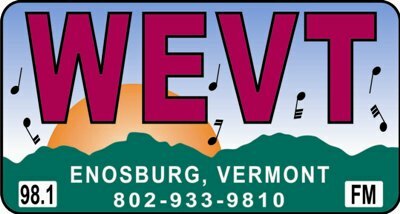 About WEVT-LP: WEVT-LP is one of the oldest Low Power FM Stations! We started broadcasting November 15, 2004. WEVT-LP broadcasts from the historic Spavin Cure Building on Main Street in Enosburg Falls. We are a non-profit low power community oriented station designed to create a communication infrastructure to entertain and educate the citizens in the communities of central Franklin County.